How do I Tell Multiples Apart? Based on an article from Huffington Post, citing studies done by the CDC, “the birth rate for twins has increased a whopping 76 per cent since 1980.” With the prevalence of multiples on the rise, there is a need for more information and resources on dealing with common issues for twins and higher order multiples. One common question we hear from parents who are expecting twins or triplets is how do you avoid mixing them up? 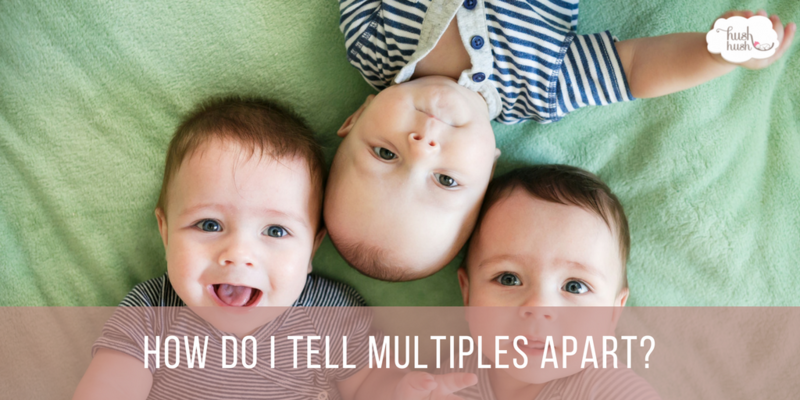 Below you will find some pointers on how to tell multiples apart, so you don’t become confused. Just because all the babies are the same age does not mean they have all of the same features. Even identical twins can sometimes have physical characteristics that are distinguishable. Therefore, one of the ways you may be able to tell multiples apart is to find a physical identifier such as a birthmark, a particular swirl direction in their hair, stork bites, or even a scar. Being aware of these little details can be a life saver when it comes to not mixing up your babies. If your children don’t have easily identifiable or readily available physical identifiers, you can easily separate your babies by dressing them in distinct color palettes to tell multiples apart. For instance, if you were to have twin boys, you might fill one boy’s wardrobe with blue and green while the other may have mostly red and yellow in their closet. If you keep each child consistently dressed in the same set of colors, it becomes effortless to determine who is who. Similarly, parents have been known to mark their children with a colored marker in a place that is easy to identify. If you don’t want to limit the colors each child can wear, you can easily utilize accessories to tell multiples apart. It could be a bow, headband, sock style, or style of pacifier clip but the key is to make sure that you are consistent with how you use your system. It is also necessary to avoid items that might be dangerous to your child (avoid things they can swallow or choke on) and things that could be easy for your child to lose.